His non-fiction includes essays on theosophical philosophy, Krishnamurti and his books are available on-line. They include critical studies on T Subba Row, an earlier member and expounder of theosophy and world-culture. 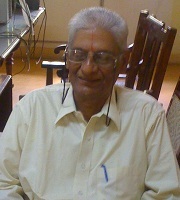 He reviews books for the national and international journals, like The Hindu, The Theosophist, Indian Literature, etc. He lives on the campus of the International Headquarters of The Theosophical Society, Adyar, Chennai 600 020.(India). He is on the panel of Translators for Sahitya Academi, National Book Trust India. Being a keen student of philosophy, his writings lean towards meta-physics, epiphany and behavioral psychology.